Scroll down to see the top not-for-profit colleges and universities in South Carolina offering online degree programs. Trident Technical College has online programs for students interested in a university transfer or in gaining a technical education. Students who want to continue their education at a four-year college can complete the first two years of a bachelor's degree and earn an Associate in Arts from Trident. In completing the AA, students get the required general education credits out of the way at a low-cost community college. Technical degrees available online include criminal justice, homeland security, and business technology. In the business tech program, students can study accounting, administration, or office or computer technology. Trident uses a compressed, seven-week schedule for its classes, and online classes are usually delivered in an asynchronous format. Florence-Darlington Technical College was the first South Carolina college to offer a degree online. Today, the college has six associate degrees and four certificates that students can complete entirely online. Most of the offerings are in the field of business and manufacturing, including an associate degree in robotics production and a certificate in robotics assembly technician. FDTC also offers an online degree in criminal justice technology and a transfer degree for students who will continue their studies at a four-year school. Online students can do their coursework at any time that fits they schedule, but they must log into class at least every other day. Local students have to come to campus for supervised exams. The university offers undergraduates the choice of pursuing the following bachelor's degrees online: B.A. Elementary Education, B.A. Liberal Studies and B.A. Organizational Leadership. These online programs are offered through Palmetto College, which is the online bachelor's completion program of the University of South Carolina system. USC also has the following graduate degree programs available online: M.Ed Teaching, M.Ed. Educational Administration, Master of Health Information Technology, Master in Public Health, and a Doctor of Education in Curriculum & Instruction. In addition, USC has several individual courses available online, some of which are accessible on demand, while others follow the regular class schedules during each semester. Piedmont Technical College has transfer and career degrees available through online coursework. Students who plan to transfer to a four-year school can earn an Associate in Arts or Associate in Science degree, which covers most of their general studies requirements and some lower-level courses in the intended major, or electives if the student hasn't selected a major. Students who want to enter the workforce can earn an Associate in Applied Science in business or in administrative office technology. The administrative major has three concentrations: accounting, legal, or medical. Piedmont Tech also has online certificates in funeral service education and office technician. Online classes are delivered asynchronously, and all courses require at least one proctored test. Limestone College's Extended Campus, which includes its online programs, was designed to meet the needs of adults returning to school. Online classes are presented in accelerated eight-week terms, with six terms available each year. Students can take two classes per term and still work full time, allowing them to complete 36 credits a year. Coursework is asynchronous, so students can study when and where they want. Online students can earn a range of associate and bachelor's degrees. Students who opt for a business administration degree can choose from seven majors, and computer science students can choose from four majors. The 2018 U.S. News rankings place Limestone No. 14 for Best Value Schools among southern regional colleges. Clemson University offers online undergraduate courses in fields like accounting, art, astronomy, biology public speaking, communications, construction management, counseling, education and many more. In addition to offering online courses for undergraduate students, Clemson University offers several graduate programs that can be completed entirely online. These programs include master's degrees in biological sciences, construction science management, public administration, youth development, human resource development and parks, recreation and tourism management. Clemson also offers a graduate-level engineering certificate and degree online and was ranked 53rd in U.S. News & World Report's 2015 list of "Best Online Graduate Engineering Programs." Midlands Technical College has an array of more than 450 online classes to meet the needs of transfer students and those seeking job training. Students who plan to transfer to a four-year school can begin by earning an Associate in Arts or Associate in Science online. Students with a clear idea of what they want to do in the future can declare a major, but these transfer degrees allow you to complete general studies requirements while you're deciding on detailed career goals. MTC has transfer agreements - it calls them bridge programs - with eight colleges and universities that allow for seamless transfer of credits from Midlands. The colleges include the University of South Carolina and South Carolina State. Charleston Southern University was ranked 21st for Best Online Bachelor's Programs in the 2017 U.S. News rankings, with the Bachelor of Science in Organizational Management degree featured. The college's non-MBA master's programs were ranked 101 in the same survey, which gave the university high marks for student engagement and faculty credentials. The university's bachelor's programs are designed for working professionals, and classes are delivered in seven-week sessions, with two sessions per semester. Because of the rolling admissions policy, students can enter a program at the start of any seven-week session. Options include bachelor's degrees in various management disciplines as well as in technology. Grad students can earn degrees in several management disciplines, nursing, analytics, and other subjects. The University of South Carolina-Upstate offers two degree-completion program that students can complete through 100 percent online coursework. USC-Upstate offers an online program for registered nurses who have want to complete work for their Bachelor of Science in Nursing. The program is open to nurses with an unencumbered license, and students may enter the program at the start of the fall or spring semester. Once they have completed basic education requirements, nurses can complete the program in one year of full-time study or two years of part-time study. The Bachelor of Science in Criminal Justice program is open to applicants who have completed at least 60 credits of previous college work and who have finished a majority of their general education requirements. Applicants should have a GPA of at least 2.0 on prior college work. All students are assigned an academic adviser who consults with the over them phone before they register for classes. North Greenville University offers six online undergraduate degrees for adult students, who must be at least 22 years old to apply. Applicants may be first-time freshmen or they may transfer credits from another college or university. Each degree program offers students the opportunity to perform an internship or otherwise gain hands-on practice in the field, often in their own community. Additionally, several of the online programs grant students academic credit for previous work experience. Students in the online business degree program follow the curriculum for the concentration in leadership and management, and they can also choose a minor in marketing. Students in the Christian ministries program must perform two ministry practica, which can be done at their local church or through an overseas mission or nonprofit organization. Criminal justice students work an internship for credit. Elementary education majors may take part in field placements where they observe, interact with and teach children. Students in the general studies program may earn academic credit by taking a mission trip that lasts for at least seven days. Online psychology majors may be able to work an internship in their senior year. Southern Wesleyan University's online programs allow working adults to earn a college degree, with degrees available at all levels from associate to master's. Most of the programs are focused on business or education topics. Students who have little to no college background can begin with the Associate of Arts in General Studies degree, which will allow them to complete the necessary general studies requirements for one of the bachelor's degree programs. The online Bachelor of Science in Business Administration allows students to concentrate in management, human resource management, or supply chain management. The Bachelor of Science in Early Childhood and Family Studies is an interdisciplinary program that does not lead to teacher certification. The School of Business offers three online master's programs: MBA, MBA with a concentration in health care administration, and Master of Science in Management and Leadership. The School of Education has an online Master of Education in Classroom Leadership with content area electives in literacy, learning disabilities, gifted and talented, and early childhood special education. The M.Ed. program is open to certified teachers with at least one year of experience. Members of the Palmetto State Teachers Association in the M.Ed. program receive a 10 percent tuition scholarship. Students who enter an online program at Anderson University are assigned a mentor, or journey coach, to help them navigate the entire college process, from transferring previous credits to registering for classes and applying for financial aid. AU Online offers a variety of undergraduate and graduate degrees designed for working adults. Most of the degree programs are in the fields of business, criminal justice, allied health, and Christian studies. AU recently added an online MBA that can be completed in 20 months. MBA courses are delivered in a six-week format and are taught in a Christian framework. Undergraduate degrees offered include business administration, with options to specialize in applied computer or health care management; criminal justice with concentrations in homeland security, emergency preparedness, and law enforcement; emergency services management; human resource management; Christian studies; liberal studies; and an RN to BSN program. In addition to the MBA, graduate programs available include Doctor of Ministry, Master of Education, Master of Ministry, and Master of Music in Music Education. Students seeking an online bachelor's or graduate degree are eligible for federal financial aid. All online students pay a reduced tuition which makes them ineligible for scholarships the university awards. Columbia International University, which was founded as Columbia Bible School in 1923, offers a variety of master's degree programs completely online. Coursework for these classes is presented in an asynchronous format, so students can log on when and where they want to look at course content. Occasionally, students may be required to attend a webchat at a specific time, but the course syllabus will outline when this might occur. Online students never have to go to the CIU campus in South Carolina. Applicants to all the online master's programs must have an undergraduate degree with a GPA of at least 2.5, and they must submit a recommendation from a pastor who has known them personally for at least two years. Master of Arts programs offered online lead to a degree in intercultural studies, Muslim studies, theological studies, or Bible exposition. Students in the online Master of Education program can concentrate in educational administration or instruction and learning. The Master of Divinity program offers a choice of four concentrations: Bible exposition, global studies, ministry studies, or Muslim studies. Students accepted to the RN-BSN program offered by the School of Health Sciences at Francis Marion University have the option of earning the degree online. The required 30 credit hours can be completed in just 11 months if students pursue a full-time plan of study. The Family Nurse Practitioner track of the Master of Science in Nursing (MSN) program follows a hybrid delivery system. Classes are available online or face-to-face on campus every Wednesday. Students who begin the program in the spring semester can expect to earn their degree in two years. It will take slightly longer for students who begin the program in the fall. The Nurse Educator track of the MSN program can be completed entirely online. This program of study was developed collaboratively with the Graduate School of Education to prepare graduates for careers as nurse educators in either an academic setting or in a clinical practice field. Students who complete the program are eligible to apply for national certification. The university's School of Education now offers online courses for three of its graduate degree programs: Master of Education (M.Ed.) in Instructional Accommodation, M.Ed. in Learning Disabilities, and Master of Arts in Teaching - Learning Disabilities. 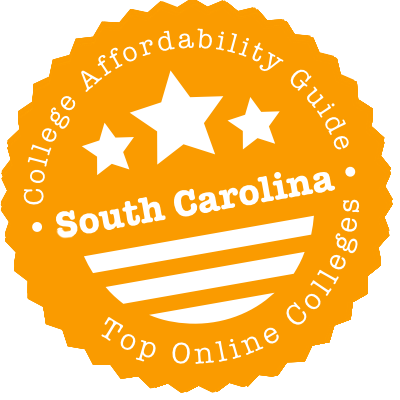 Deciding to study online in South Carolina is your first step. Step 2 is picking a school. To help you decide, we’ve created this short guide. We’ll explain where to search for online degrees, push you toward free college credits and explore out-of-state discounts. Then, we’ll talk about the most affordable online colleges in South Carolina as well as note schools with accreditation issues. Finally, we’ll leave you with a list of resources. In coordination with over a hundred universities across 15 states in the South, the Southern Regional Education Board (SREB) Electronic Campus maintains an online program & course catalog. Though not comprehensive, it lists dozens of degree program and even more individual courses. If the program carries the “E” label, it means tuition is set at the Electronic Rate, which is the same for residents and nonresidents. Institutions participating in the Electronic Campus include University of South Carolina campuses (Aiken, Columbia and Upstate), state technical colleges (Aiken, Horry-Georgetown, Piedmont and Trident), other state universities (Clemson University and Medical University of South Carolina), and private colleges (Converse College and Limestone College). One advantage of studying online is you can go anywhere, right? Well, nonresident tuition rates at state schools often put a damper on that idea. But with SREB’s Academic Common Market-Electronic Campus (ACM-EC), you can still pay in-state tuition for out-of-state programs if South Carolina doesn’t have the degree you want. Fifteen states participate in the ACM-EC, but your degree must be on the list of approved ACM-EC programs to qualify for discount tuition. Apply for admission to the university and get certified as a South Carolina resident. The website will walk you through the process. The University of South Carolina system has done something interesting. It’s created a separate school called Palmetto College to handle two components of its education offerings: two-year degrees and online bachelor’s degree completion. Palmetto College is really just a name. In actuality, courses are taught by professors from each of the USC system’s instructors, and your degree will come from a specific USC campus. Palmetto College is particularly useful for transfer students. Since it includes the four 2-year degree schools within the USC system (Lancaster, Salkehatchie, Sumter and Union), going to one of those schools for an associate degree means you can effortlessly transfer your degree into one of Palmetto’s online bachelor’s degree completion programs. You’ll apply through Palmetto College and pay the Palmetto College rate, but your degree will be issued by whichever campus administers the program. The South Carolina Department of Education has set up VirtualSC to make supplementary online classes available to 7th through 12th graders at South Carolina schools. All courses in the catalog are asynchronously delivered, maximizing student flexibility. Take as many as you want, but we recommend focusing on VirtualSC’s 10 Advanced Placement (AP) courses as you get closer to college. That’s because AP course syllabi prepare you for AP exams. Score at least a 3 or a 4, and you’ll likely get college credit (depends on the college you attend). Because VirtualSC is free, all you’ll have paid is the registration price for the AP exam. There are many good online colleges in South Carolina. There are also many affordable ones. But to get on our list, you have to be both. We’ve looked at criteria such as transfer flexibility, net price, and graduation rates and converted them into a CAG Score that you can see next to each school’s profile in our ranking. If you’re trying to decide between an affordable school and a pricier option, use the U.S. Department of Education’s College Scorecard to get more geeky stats. Upstate Online is the place to find a full list of USCU’s online degrees, courses and hybrid programs. With the hybrid programs, more 70% of the course credits are available online; the rest can be earned at the USC Upstate Greenville Campus or Spartanburg campus. A lot of USCU’s undergraduate options are online completion programs offered under the USC/Palmetto College deal. Need to save money? USCU distance education students pay the same tuition & fees as campus students and South Carolina residents usually get a tuition break! Financial aid is available for online degrees—the Office of Financial Aid can assist with questions on funding. Are you an out-of-state resident? Check the website for details on state authorization to make sure you’re eligible for the program. In most cases, a degree from an unaccredited institution is worthless, so make sure your chosen college is accredited. National accreditation qualifies you for federal financial aid, while regional accreditation does that plus makes it easier to transfer credits. Look for accreditation from the Southern Association of Colleges and Schools Commission on Colleges (SACSCOC), or SACS. All public degree-granting higher education institutions in South Carolina have it, as well as reputable private ones. Click on South Carolina on the homepage to find SACS-accredited schools. Scan the page to check for public sanctions. If you see a warning or probation, go to the Accreditation Actions section to find out why that action was taken and what it means. The SACS directory of South Carolina schools won’t feature nationally accredit colleges and branch members of nationwide chains, so double-check a school’s accreditation status by exploring the Council for Higher Education Accreditation (CHEA) Database. Before you get too invested in a Carolina International University education, look closer at the homepage. It states that the school isn’t an American university and does not offer any courses. In other words, it’s a degree mill and won’t appear in the CHEA database or on College Scorecard. Cathedral Bible College‘s founder went to jail for fraud in 2014 for luring international students to the school under false pretenses. When they got there, instead of learning, he forced them to work for substandard (or no) wages under threat of deportation. All of this came to light after several Cathedral students informed the Department of Homeland Security that their classes weren’t real. Southern Association of Colleges and Schools Commission on Colleges (SACSCOC): SACSCOC, or just SACS, is the regional accrediting body for South Carolina’s postsecondary institutions. South Carolina Transfer and Articulation Center (SC TRAC): At some point, you may want to switch schools. SC TRAC will guide you through the process at any of South Carolina’s public colleges or universities so you can see how prior coursework will be applied toward a new degree. (Toward your major? As an elective? Not at all?) It’ll be really easy if there’s a transfer agreement between schools, which you can determine here. It’ll take a bit longer if you have to search for course equivalencies. Palmetto College: All of the University of South Carolina’s degree completion programs are in one place — Palmetto College. Get connected to financial aid and apply for admission directly through the Palmetto College portal. Southern Regional Education Board (SREB) Electronic Campus: Explore online degree programs or courses provided by SREB institutions. Plus, get answers on credit transfers, financial aid policies and net pricing. VirtualSC: Check out free online courses you can take for credit in junior high and high school.